Nigel Cooke, aka monkeyleader, is an Irishman currently living in Cambridge who happens to be on holiday on Mull right now. He may just be one of the best real-time bloggers I’ve come across of late. He’s written an engaging entry in his blog about a quick return trip to Mull after a visit earlier in the year, which made him and partner Nicola fall in love with the place. Seems Nigel’s a bit of a polymath, not only having a rather good writing style but also some excellent photography skills to boot. Vivthesetter, real name Paul from Warwickshire, was on his holiday break up on Mull this August and appears to have spent a lot of his time pointing his Nikon D300 at the bird life that covers the island. Of course it’s not all birds. He’s also got some charming images of interesting places and other wildlife dotted around various parts visited. 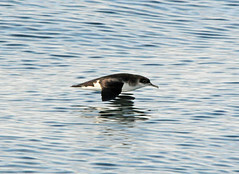 He was successful in snapping a Minke Whale, Basking Shark, some excellent shots of a White Tailed Sea Eagle and, the one which really caught my eye, this Manx Shearwater, skimming so close to the surface of the sea, yet looking so laid back whilst doing so. You can check out the rest of his photos from Mull in two Flickr sets he’s created of his visit to bonnie Scotland’s Inner Hebrides, called Isle of Mull 2010 and Isle of Mull Wildlife. Thanks for sharing your pictures Paul. So, all things considered, I found this rather short BBC programme quite informative. With only 10 minutes there wasn’t much talk of some of the resistance to the growth in eagle numbers from farmers, who feel that these beautiful birds are predating lambs. More studies are being done but, for now at least, it’s uncertain whether eagles actively kill live lambs or are simply scavenging dead carcasses. There’s no doubt that eagles have been very beneficial to tourism on the Island. At Beach House we’ve seen them floating around high up over Loch Scridain and the Ross of Mull. Of course, people visit the island for many reasons, but there’s no denying that the eagles add something special to the mix.